Sorry, I haven’t been posting properly this past week! I was taken down by the worst cold that I’ve had in years. I felt like I was incapable of doing practically anything. I tried taking some time off work, but I hate feeling unproductive for too long. Now while I am still slowly recovering from that terrible, awful, no good cold, I did find some great ways to cope and make that cold a little easier to handle. 1. Crane Hippo Cool Ultrasonic Humidifier – Humidifiers are an absolute necessity for any winter cold. All that nose blowing can make your nasal passages super congested and dried out. A humidifier increases the air moisture in the room to make it easier for you to breathe. I loved having a humidifier to leave on in the bedroom at night. It made it ten times easier for me to sleep through the night and how can you resist the cute Crane humidifiers. I just want them all! 2. Smith Brothers Warming Throat Drops – I was obsessed with these throat drops during the peak time of my cold. These Warm Apple Pie throat drops were not only crazy delicious, but they didn’t make me feel sick after eating a ton of them. Seriously delicious! 3. Emergen-C Warmers – I always go through at least one pack of Emergen-c packets each time I even think I’m getting a whiff of a cold, but I loved discovering these new Emergen-c Apple Cider warmers. You drink it hot and it tastes like Apple Cider, what could be better? 4. Binge Watch Netflix – A pre-requisite for any cold is a whole lot of tv binge watching. Netflix makes that so much easier. I can stream seasons and seasons of Bones, Scandal and The Office and nap throughout. 5. Homedics Personal Ultrasonic Humidifier – When I went back to work, I realized that NOT having a humidifier at work really sucked. I mean, coping with a cold at work is ten times harder so you definitely need to find ways to make it better. Having this teeny tiny personal humidifier on my desk was perfect for getting through the worst of my cold. It even can be powered through USB so I just popped it into my computer. 6. First Aid Beauty Ultra Repair Cream – All that nose blowing and rubbing made the skin around my nose dry and flaky, which just made the cold feel that much worse. I was really glad to have a little container of the Ultra Repair Cream to take with me everyday. A little dab on my nose and all the flakes would disappear. 7. 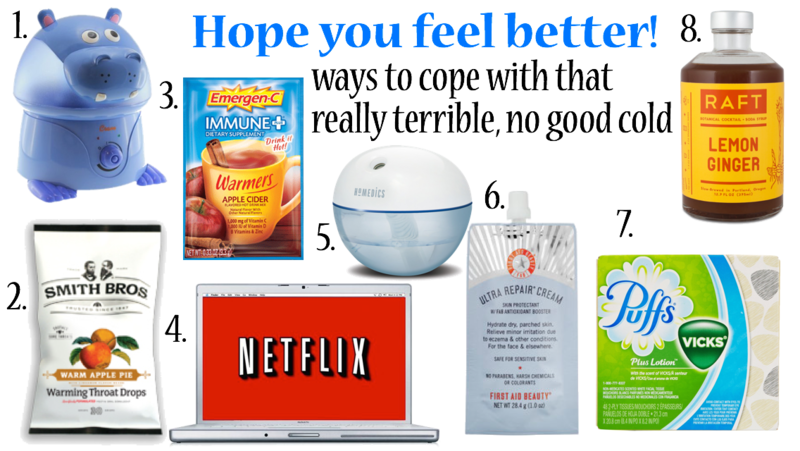 Puffs Plus Lotion with the scent of Vicks – Getting a cold, I know I’m going to go through a whole lot of tissues. This can lead to the harsh red nose syndrome that almost always occurs after using that many tissues. I found a great way to combat this with the Puffs plus lotion that also has the scent of Vicks. It kept my nose from getting the harsh red nose and the Vicks helped me breathe a little easier. 8. Raft Lemon Ginger Simple Syrup – My last absolute favorite item that helped me cope with my cold was this Lemon Ginger syrup that I used in lieu of tea and coffee. I love putting a tablespoon of this in hot water. The combination of lemon and ginger totally soothed my throat and it smelled and tasted amazing. Have any cold favorites of your own? Share them with me in the comments below! Netflix is my sick day cure! Its my favorite thing to do when I'm feeling ill! Humidifiers, hot tea, and netflix are my go-tos on sick days! Netflix and tissues, all I need for a sick day. I love curling up in the bed for a movie marathon day. Netflix and hot bubble baths! My go to when sick. Also tea. Tea heals all for me! Feel better! Being a pediatrician I'm always asked for advice for sick days! Zinc supplements are one of the few things that have actually been proven to short the duration of cold symptoms – by 1-2 days. Take them with food! Also, honey is as good for a cough as cough syrup – and doesn't have any of the unnatural additives! I love Puffs facial tissues. They are perfect when you have a cold. Hope you feel back to 100% soon. We have an elephant humidifier. Netflix is great for rest/sick days. Hope you feel better soon! That pesky flu/cold is really making it's way around these days! I got those apple pie throat drops over the weekend. They were a lifesaver!! Tasted so good 🙂 Hope you are feeling better, too! I hope you're feeling better! We love our humidifiers! Without them, we would be sick all the time!